Sometimes there just isn’t space for three pieces of equipment. That’s why Krofta offers the Sandfloat DAF solution. 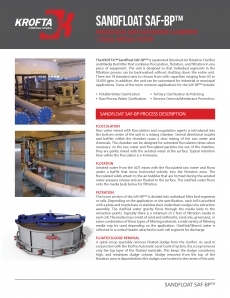 Offering flocculation, flotation and filtration in one complete system, the Krofta Sandfloat provides ultimate efficiencies while capitalizing on limited plant space. This integrated solution gives plants the advantage of maintaining rigorous production demands while streamlining operations and saving on costs. When you combine three systems into one piece of equipment, you significantly cut your construction and installation costs. With the Krofta Sandfloat you also drastically increase your production capacity. Offering higher hydraulic performance when compared with competing filtration systems, the Krofta Sandfloat saves space, time and costs while optimizing production. Combining flocculation, flotation and filtration into one system saves on costs and operating efficiencies and provides a unique solution for numerous wastewater applications. From potable water to industrial pre-treatment to wastewater polishing, the Krofta Sandfloat utilizes advanced technology to consolidate your plant operations and maximize total production.